Few experiences can bring more pain to families than having their homes demolished. For the urban poor in India, and across the world, this is unfortunately a recurrent event in their lives. Demolitions of their houses and communities are so routine that they hardly make news, and remain confined to the inside pages even if they do. And even when they do make front-page news for some reason – for example, the scale of demolitions and brutalities committed by the law enforcers – they rarely receive sympathetic coverage. For most of the mainstream media, catering to the middle classes, poor persons homes only appear as encroaching shanties that scare urban landscapes. A quiet burial in rubble of their community would have been the fate of approximately 1,000 families of Shakur Basti in Delhi, but for the tragic death of a six-month child. 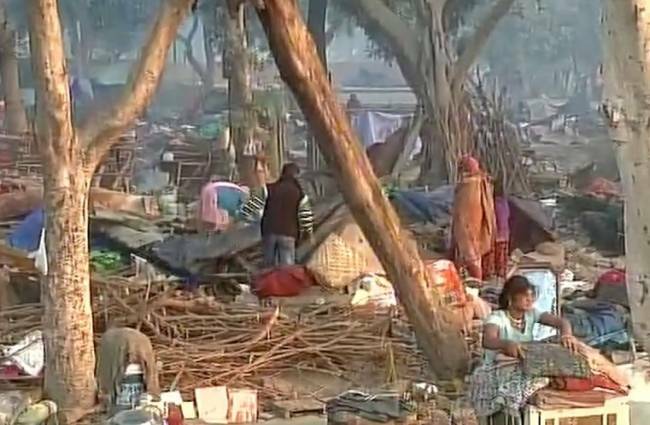 The child allegedly died during the early morning demolitions of 500 “shanties” by the Indian Railways. Had it not been for the tragic death of the child, the demolitions would have been routine. Worse, had it not been for the political dynamics of the City, with political groups at odds with each other governing the Railways and the City, even this infant death would have failed to get the incident the attention it deserved. The Railways, caught on the back foot, following the death of the infant, have since been insisting that procedures stipulated for carrying out such evictions from its lands were followed. The Railways is asserting that it served repeated notices to the “encroachers”, asked them to voluntarily leave its premises, and carried out the operation only after being left with no alternative. It also claims that the child died before the demolitions commenced at 10 a.m. on Sunday morning. The Government of Delhi, on the other hand, has blamed the Railways for carrying out the demolition and has supported allegations that the infant died during the operation. Herein lies the irony of the incident that is making cacophonic news. The discourse and debate has virtually no one invoking the right to shelter, for example, a basic human right, well recognized in both international and Indian jurisprudence. The Delhi High Court has itself recognized the right of the urban poor repeatedly, for instance in Sudama Singh & Others v. Government of Delhi on 11 February 2010. It is evident from the judgment, any evictions without relocating dwellers with dignity will violate the basic survival needs of the dwellers and will thus be in contravention of the Order. Which procedures have the Railways followed, then? Similarly, the primary responsibility of looking after the interests of the slums, and also their resettlement, lies with the Delhi Urban Shelter Improvement Board (DUSIB), which functions under the control of the Govt. of NCT of Delhi. What was DUSIB doing when the Railways were serving eviction notices to the community? Was it even aware of these notices? And, what actions did it take to ensure resettlement? Or, never mind resettlement – what action did it take to even resettle them or at least get the Railways postponing the demolitions till the biting winters of Delhi pass? The Government of Delhi claims that the Railways did not keep it in the loop. If that is true, it represents both a lack of coordination between government authorities and a criminal neglect for the lives of the urban poor. Their lives mean nothing for the government labyrinth that stifle the poor, choke life out of them. It then keeps passing the buck from one department to other, one agency to other with no identifiable command to take the blame and offer redress. It seems that human beings in slum dwellings do not exist for the authorities. If they did, those homes would not have been demolished with the winters having set in, exposing the children and the elderly, especially, to the mercy of the elements. Demolitions of people’s houses without dignity cannot be humane. Those responsible for deciding and executing such a demolition should have looked into their common humanity even more than the procedures and refrained from this drive in the winter.